The steps you take to make a quilt sandwich depend on the type of quilting that's planned for the project. The quilt sandwich is made up of the quilt top, the batting, and the quilt's backing. Layers are secured together using a process known as basting. 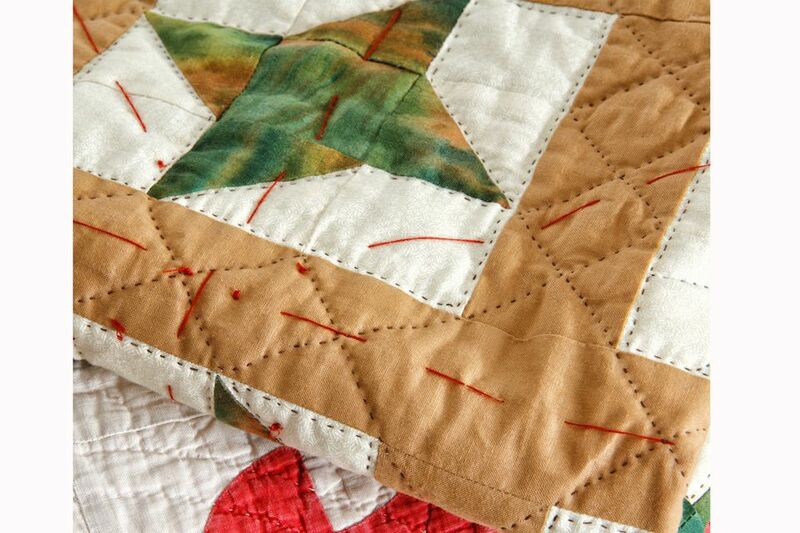 Use a contrasting pencil or chalk to mark the quilting motifs on top of the quilt. There are many types of markers that can be used to draw lines on a quilt. Test new markers to make sure their lines are easy to remove when quilting is complete. Take a photo of the quilt if you're unsure how it should be quilted. Print the photo a few times and experiment with designs until you find something you like. Your quilt may not need to be marked if you plan to stitch in the ditch or use other types of quilting stitches, such as evenly spaced parallel lines or meander quilting. Straight lines are easy to machine quilt with a walking foot. Prepare and press the quilt backing. It should be three to four inches larger than your quilt top on all sides -- more if you plan intricate quilting stitches. Why? Because the backing draws inward as quilting stitches are added. Lay the backing fabric right side down on your work surface. Secure the backing fabric to the surface at regular intervals. You can pin the backing to a carpet or use wide painter's tape to adhere it to smooth surfaces. The backing should be taut, with no wrinkles. Center a piece of batting on top of the backing -- the batting should be about the same size as the backing. Smooth to remove bumps. Check the reverse side of the quilt top and remove loose threads. Trim long threads that may have been left at the ends of seams. Center the marked quilt top right side up on top of the batting. Smooth the top to remove wrinkles. Basting is easy when you use the right tools and position your quilt sandwich on a surface that is at the right height and doesn't cause discomfort as you work. The size of the surface depends on the size of your quilt -- it should not fall off of the sides of a table or other flat area. Traditionally, hand quilted projects are basted with long stitches taken with a needle and thread. Use enough stitches to keep the layers from shifting and stitch in different directions as shown in the photo. White thread is often used to eliminate the worry of dye transfer from the thread to the quilt. Today's threads are generally colorfast so that guideline isn't as important as it was in the past. Hand quilters often choose to baste with fusible and adhesive products. Follow each manufacturer's instructions if you choose to baste with adhesives. Quilts that are machine quilted on a home sewing machine are usually basted with safety pins. Regular safety pins work just fine but specialized pins make the task easier. They are available at most quilt shops and fabric stores. Adhesive products can be used for machine quilting if you prefer. Quilts sent to a longarm quilter for professional quilting aren't sandwiched at home. The quilter will explain what's needed and tell you how large the backing should be if you choose to make it yourself. Once the quilt sandwich is basted you can quilt the project by either hand or machine.